In a digital gambling world dominated by thousands of new Online slot game, sometimes you need to mix things up a bit and try some other types of games. While there’s plenty of digital scratch cards as well as the more casual games of bingo and keno, many players of slots online will find themselves wanting to stay in the classic world of casino games. At SlotsBaby, there are dozens of variations on video poker available but one classic casino game that go a little forgotten is the game of Blackjack. Gamevy is an award-winning supplier and operator of high-quality online games and casino games. A rare company whose portfolio isn’t dominated by slots online, they provide just as many lottery games, scratch cards, casino games and even online gameshows! Many of their games are available on mobile as well as desktop meaning they can be played on the go as well. If you love promo's, check our Slot offers today. In Gamevy’s Blackjack, you can play up to 3 hands at a time against the dealer. There is a choice of 7 chip values – 1, 2, 5, 10, 25, 50 and 100. These can be mixed and matched to create the bet you want. Click the play icon when you wish to play or press the X icon if you wish to cancel and replace a different bet. The aim is to get as close to 21 without going over. The 2-9 cards are worth their number. 10, J, Q and K are all worth 10 while an Ace can be worth 1 or 11. Once you are in the game, you are dealt 2 cards face up for each hand you are playing, and you play each hand in turn. The player has the choice to stick with the value of their cards, add a card or double their bet if they’re feeling lucky. You can also split your hand if you have a matching pair. That will split your hand into 2 separate hands, doubling your bet but also doubling your potential winnings if you beat the dealer’s hand with both of your own. The game also does well to recreate the ambience of a casino with relaxed lounge being played by a house jazz band, gentle drums complementing the double bass and tinkling piano while the chatter of people trying their luck at the next table can be heard. 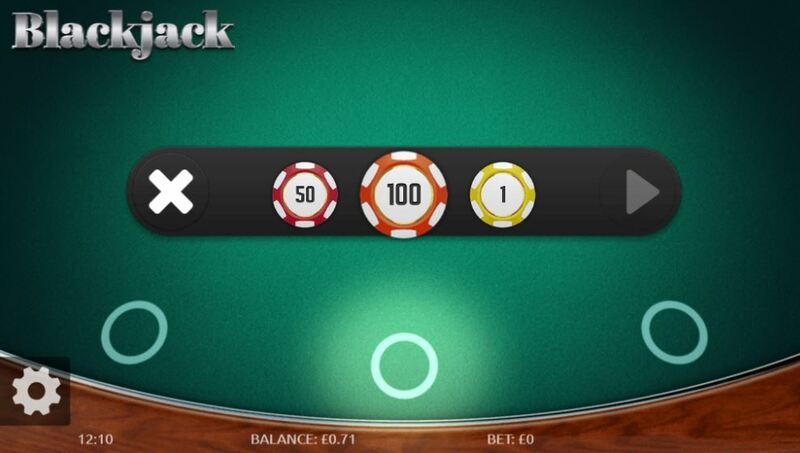 The sound or music or both can be turned off so, like the bets, everything is totally customisable in Blackjack.